Maintaining a remote backup of your Windows Mobile contacts, calendar, schedule, tasks and other documents, pictures and MP3s has traditionally been a problematic task, leaving Windows users looking on in envy at the owners of Apple Macs and iPhones and their iDisks and other solutions. Thankfully as part of an overdue concerted move to develop the Windows Mobile and Hotmail/Live platforms, Microsoft have developed the My Phone, a secure online repository for contacts, SMS messages and other vital information stored on your Windows Mobile device that can be added to or cut down as the user sees fit. A great storage facility for MP3s, videos and photos, Microsoft currently offers 200 MB of space to My Phone users – enough to keep a back up of vital documents, ringtones and videos. To use My Phone, you need a Live or Hotmail account (sign up at accountservices.passport.net), and a Windows Mobile device with an internet connection. When using any web service on a mobile device it is vital to have a generous data plan setup. There’s a potential of up to 200 MB of data being transferred to your My Phone storage from your Windows Mobile device – as such a flat-rate monthly data transfer tariff is vital unless you have reliable, regular WiFi access. Download My Phone from myphone.microsoft.com and install on your Windows Mobile device; meanwhile visit the sn1-p3.myphone.microsoft.com domain in order to login to your My Phone account on the web. Once installed on your Windows Mobile device, run Microsoft My Phone. You’ll be prompted to login – use your standard Microsoft Live or Hotmail details here, the same credentials you use to login to the web service. Once logged in, My Phone will determine which type of synchronization to run. 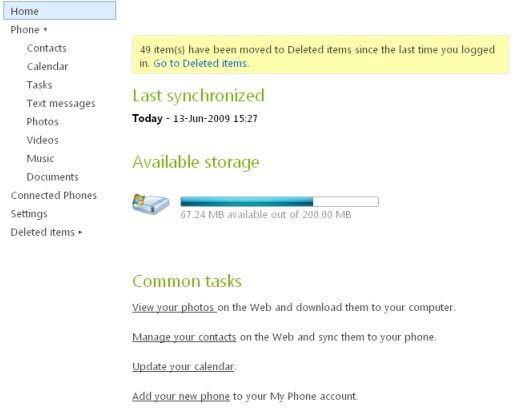 The vital contents of your Windows Mobile device can be backed up to the My Phone storage either automatically on a schedule determined by you, or manually, whenever you command the app to sync. 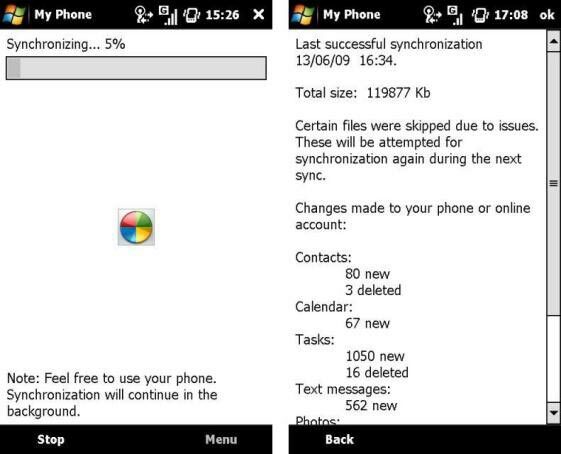 Depending on the volume of data to be stored, Microsoft My Phone can take a while to complete synchronization on the first attempt. Subsequent syncs are appends however, meaning that only information that has changed is synchronized. Contacts – all contacts from your phones address book. This is a good way to backup the contacts from your SIM card. 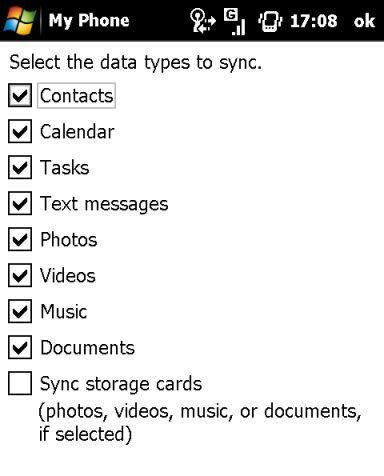 Calendar and Tasks – if you sync your phone with Outlook or an Exchange server, your calendar and tasks will also be synced with Microsoft My Phone, so these might be options to ignore. Text Messages – a great way to keep a backup of vital text messages. Videos and Music – depending on the type of device you use, videos and music might be no-goes, or you might find that with the limited 200 MB of space you choose one of the other. Modern Windows Mobile devices come with 3 MP cameras or better, resulting in higher file sizes, which means your My Phone server space could get eaten up. Documents – Photos, videos, music and documents can all be uploaded from your PC or from your phone. Vital documents in particular can benefit from this functionality, with My Phone giving you a remote backup option that means documents can be restored to your Windows Mobile device or your PC. Sadly at present however there is no synchronization client for Windows XP or Vista, meaning that uploading to the My Phone storage area must be done manually, one item at a time. Sync storage cards – if there is any space left on your My Phone storage space it can be used to backup any storage cards installed on your Windows Mobile device. From the same Menu, you can also access the Schedule screen to set a daily, weekly, monthly time for the synchronization. Microsoft My Phone will synchronize in the background without causing any serious interruption to your general phone use – however it is a good idea to schedule syncing to take place during the night. Microsoft My Phone is a free service, one that brings the matter of remote storage for the Windows Mobile platform into line with other smartphone providers such as Apple and various mobile networks. The 200 MB capacity is modest; however it is expect that Microsoft will increase this considerably over time, so now in this post-beta phase it is the best time to get to grips with Microsoft My Phone.